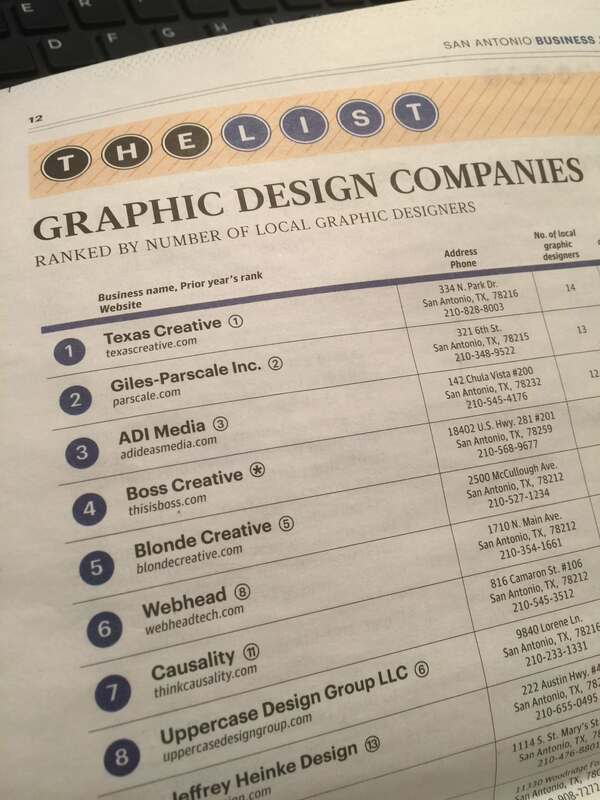 Today the San Antonio Business Journal announced that Texas Creative is the Largest Graphic Design company in San Antonio. The honor of the number one spot on “The List” is the third-in-a-row for Texas Creative. “San Antonio has such a dynamic and vibrant graphic design community. This is such an important recognition for our design team as this is the DNA of our company,” said Jamie Allen, Chief Operating Officer. “The List” is published once per year and also featured in the Book of Lists, available at the end of the year. Texas Creative is a one-stop shop for all advertising and communication services. They move at the speed of your marketplace and have been doing it for over 30 years. They have evolved year over year because of their seasoned leadership; accompanied by deep talent. Their eager staff of creative directors, writers, web developers, account and media teams bring ideas to life side by side. And most importantly, clients trust them. As evidenced by very long relationships with local, regional, national and international clients. Their work spans B2B and B2C strategies; from retail to local and state government, nonprofit and public service to healthcare, and technology to fast casual dining and financial.